San Antonio captures the spirit of Texas. 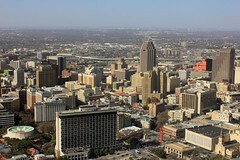 Now the eighth largest city in the United States, the city has retained its sense of history and tradition while carefully blending in cosmopolitan progress. The city has always been a crossroads and a meeting place. Sounds and flavours of Native Americans, Old Mexico, Germans, the Wild West, African-Americans and the Deep South mingle and merge. 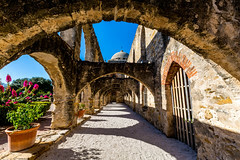 Close to twenty million visitors a year delight in the discovery of San Antonio's charms. 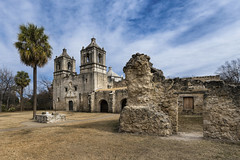 The actual founding of the city came in 1718 by Father Antonio Olivares, when he established Mission San Antonio de Valero, which became permanently etched in the annals of history in 1836 as The Alamo, where 189 defenders held the old mission against some 4,000 Mexican troops for 13 days. The cry "Remember the Alamo" became the rallying point of the Texan revolution against Mexico. Located in the heart of downtown, today The Alamo is a shrine and museum. 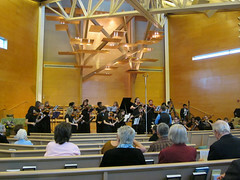 The National Festival of the States concert series offers visiting performing ensembles rich musical experiences from performing in a well known venue such as San Fernando Cathedral or participating in a workshop with a faculty member at the University of Texas. Participating groups are chosen on the basis of recommendation from state and national music educators, governors' and senators' offices and by audition. Selected groups perform in prestigious venues with maximum audience potential. I just wanted to let you know we had a fabulous time in San Antonio and Austin! The Rio Cibolo Ranch was the highlight for the students! They went above and beyond all our expectations. This is truly a keeper! The kids got to feed longhorns, fish, and learn roping. They had a fiddler, and some of the kids joined in playing with him. At the end of the evening, they brought everyone out to the grass, turned out all the lights and showed everyone what the stars looked like away from the city lights. Then our host sang to the kids as they were watching the stars. It was a wonderful evening! The clinic was great and all three venues they performed were wonderful! Playing at the capitol was a fun experience. Lots of people watching from above. They had a good crowd gather as they played. Thank you for your hard work. I can’t tell you how much I appreciate all you did for us. Thank you again.